Daily: 4:30 & 8:15 p.m. The year is 2000. There’s “Magic in the Stars” at Disneyland this year. Some of the magic began last year when Tarzan moved into the former Swiss Family Treehouse in Adventureland and Sheriff Woody took over the Golden Horseshoe Saloon in Frontierland as the TV studio for The All New Woody’s Roundup. In summer 2000, the completely overhauled Autopia opens, combining the tracks of the former Fantasyland Autopia and Tomorrowland Autopia. And an amazing new fireworks show, Believe...There’s Magic in the Stars, celebrates the park’s 45th anniversary in the nighttime sky. Disneyland needs to do spectacular things to draw guests this year. In early 2001, Disney’s California Adventure will open where the parking lot used to be. Management has a fear that out-of-town guests will postpone their trips until after the new park opens unless there are enough reasons to visit this year. 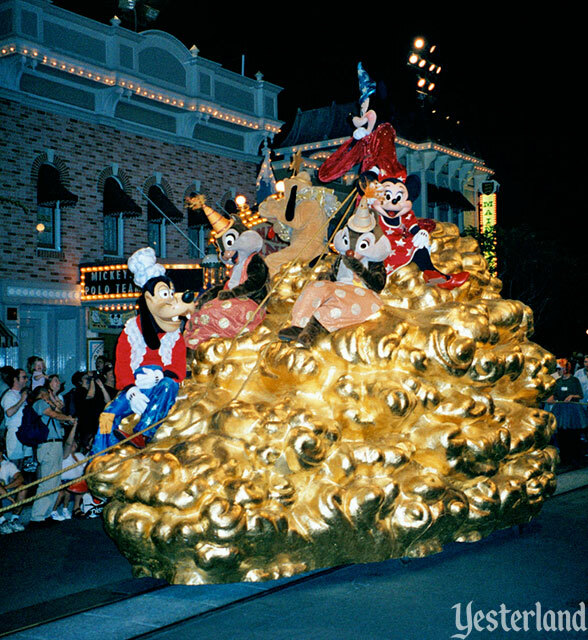 Celebrate Disneyland’s 45th anniversary with Disneyland 45 Years of Magic…Parade of the Stars. This parade is a cross between a Fantasia 2000 movie tie-in, a Disney character cavalcade, and a “see other park guests look silly” parade. Eight floats showcasing Disney characters form a regal procession along the parade route. 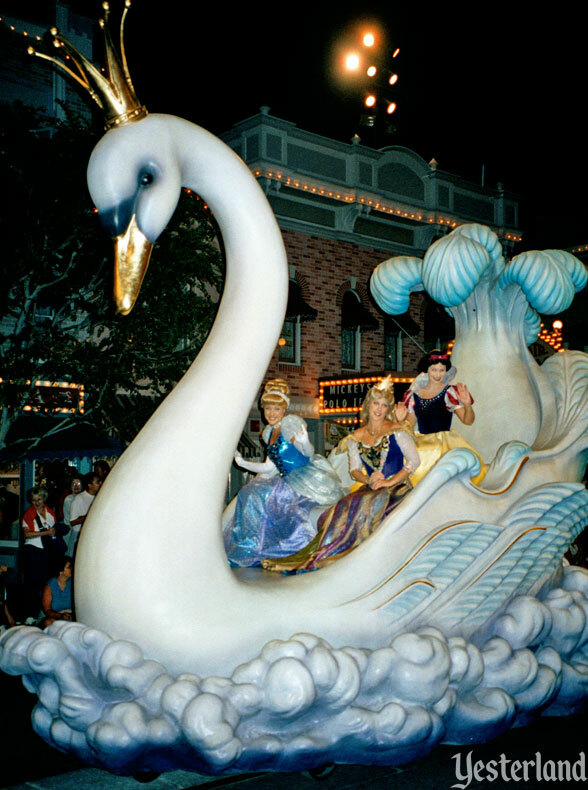 The parade begins with a float featuring the Blue Fairy from Pinocchio. It’s a nod to the opening float of the Main Street Electrical Parade, which had to “glow away forever” less than four years ago, at the end of the 1996 parade season. 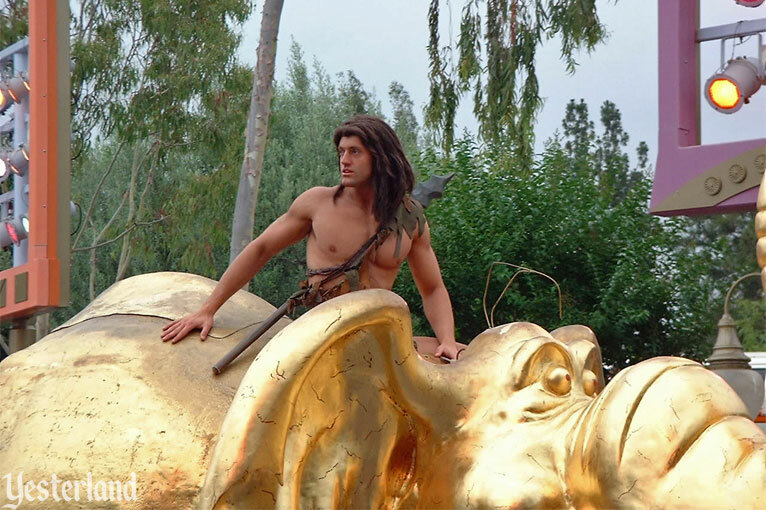 Another float features the title character from last year’s animated Disney feature Tarzan (1999) sitting on his elephant companion Tantor. 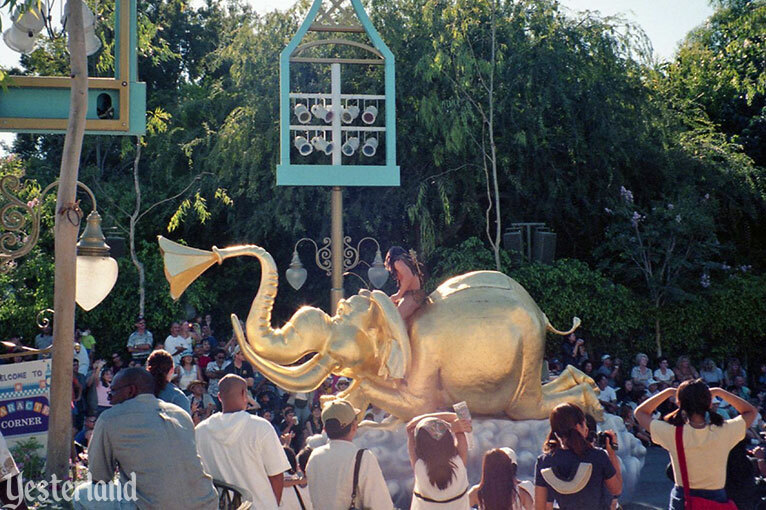 Poor Tantor has been painted gold—and he’s kneeling on a cloud. You’ll see that clouds are a recurring theme in this parade. Did you see the whales soaring through the sky in the new movie Fantasia 2000? One of the chapters in the long-time-coming sequel to Fantasia (1940)—60 years later—is Respighi’s The Pines of Rome. Whales fly effortlessly through clouds in the sky, as though swimming in water. Ah ha! Now we know where the clouds are from. The whales have golden stars on them, but at least they aren’t completely golden. There’s already been a lot of gold in this parade. Now even the cloud is golden. 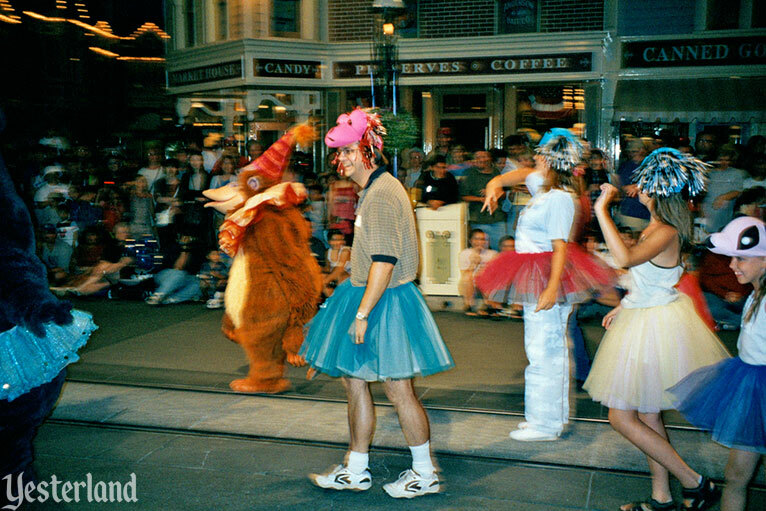 This parade doubles as the park’s daytime parade and nighttime parade. Fortunately, the park has an extensive parade lighting system left over from Light Magic. 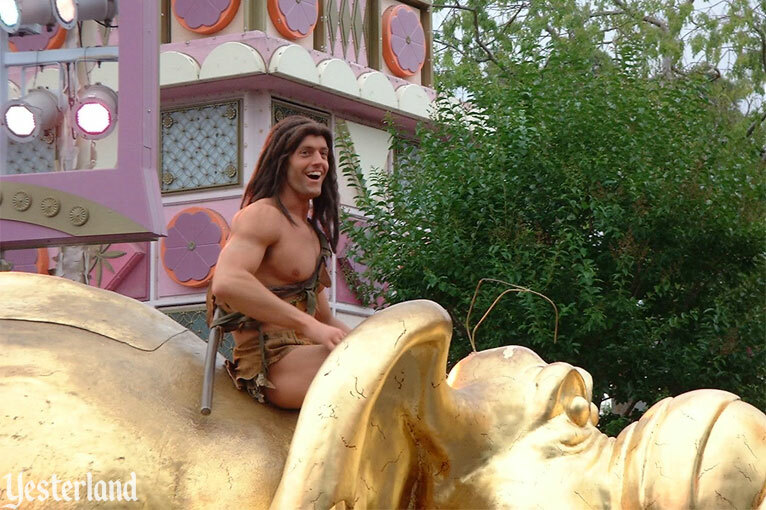 At each performance, about 50 lucky park guests are chosen to join more than 70 paid performers and costumed characters. 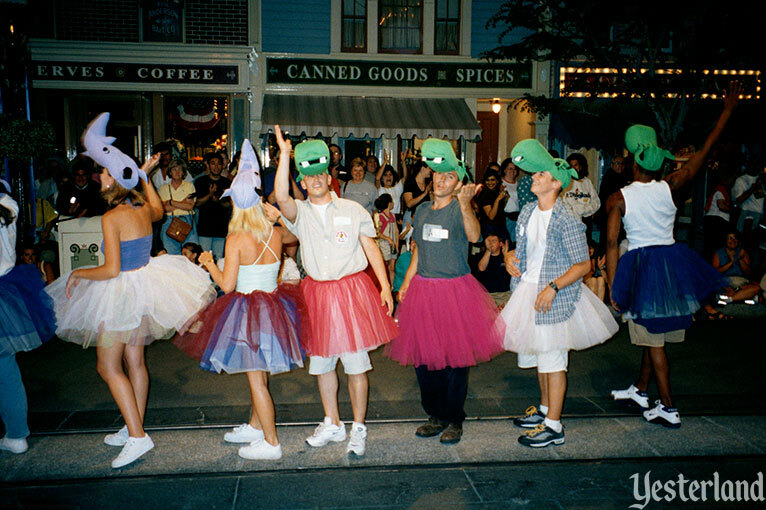 Donning tutus and animal hats, these “guest stars” provide a bit of comic relief down the entire parade route. Maybe the “lucky guests” aren’t so lucky after all. But at least they get to keep their animal hats to remember this part of their park visit. 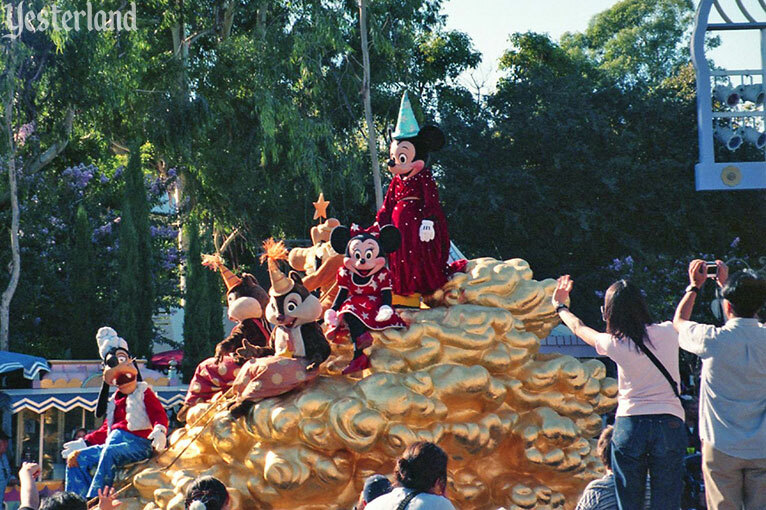 There you have it—Disneyland 45 Years of Magic…Parade of the Stars. 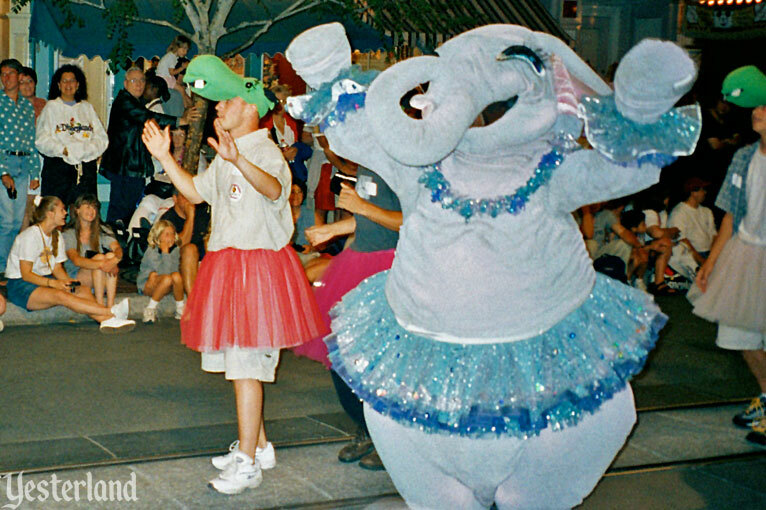 But if you think about it, this parade really has nothing to do with the first 45 years of the park. 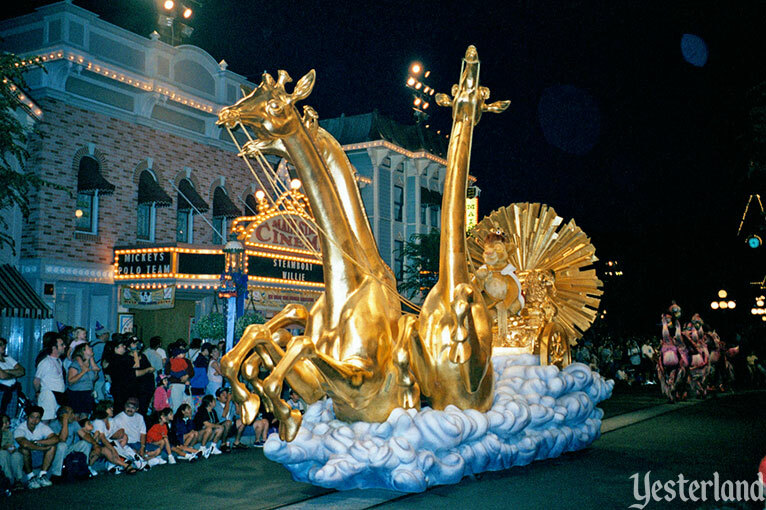 Disneyland 45 Years of Magic…Parade of the Stars premiered at Disneyland on Wednesday, February 16, 2000. 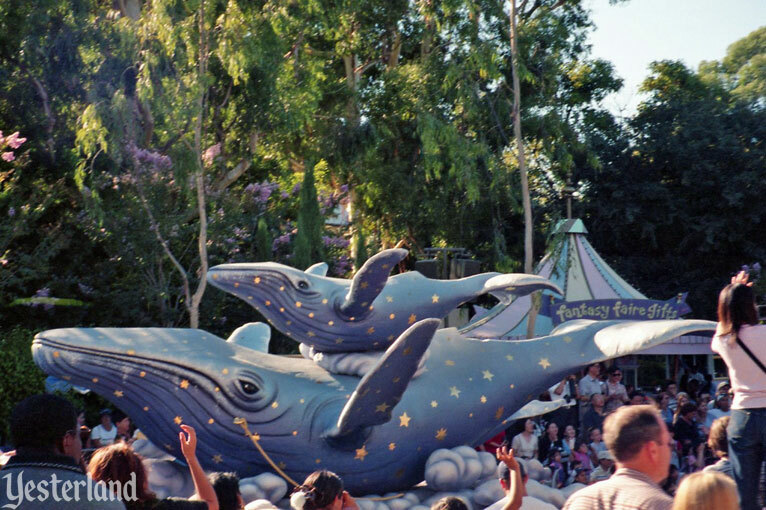 Initially the music for the parade was “Pomp and Circumstance” by Sir Edward Elgar, just like in the Noah’s Ark chapter of Fantasia 2000. Not everyone knows the name of the piece and composer, but everyone instantly recognizes it as the traditional music at school graduations. So why in the world would this slow, somber, “important” music be used for a Disney park parade? The moment that the senior procession began and I heard the band play the first chords of “Pomp and Circumstance” I felt just as choked up as I had at my own graduation from Denison, my sister’s from Smith, Breck’s from Georgetown, and Anders’s from junior high school. It was after hearing “Pomp and Circumstance” at Eric’s graduation from high school four years earlier that I went to Roy Disney and set out to convince him that few musical pieces are more powerful reminders of emotional moments in people’s lives. I suggested we use it in our new Fantasia. Eventually “Pomp and Circumstance” would become the music that accompanied a wonderful Noah’s Ark segment during which Donald Duck helps to bring all of the world’s animals onto the Ark and then rushes off to find Daisy at the last moment. Sources earlier said the park has a more up-tempo backup music in reserve should “Pomp” prove too pompous for a theme park. There was no immediate move to switch, however: The reworking was described more as an attempt to refocus the timing with the existing music. Using “Pomp and Circumstance” as the soundtrack for the parade might have scored points with Eisner, but not with most Disneyland guests. After just two months, “Pomp” was out, replaced by a medley of Disney music. In 2001, Choplin left Disney. The following year, Choplin returned to Europe as Chief Executive of Britain’s prestigious Sadler’s Wells Theatre. 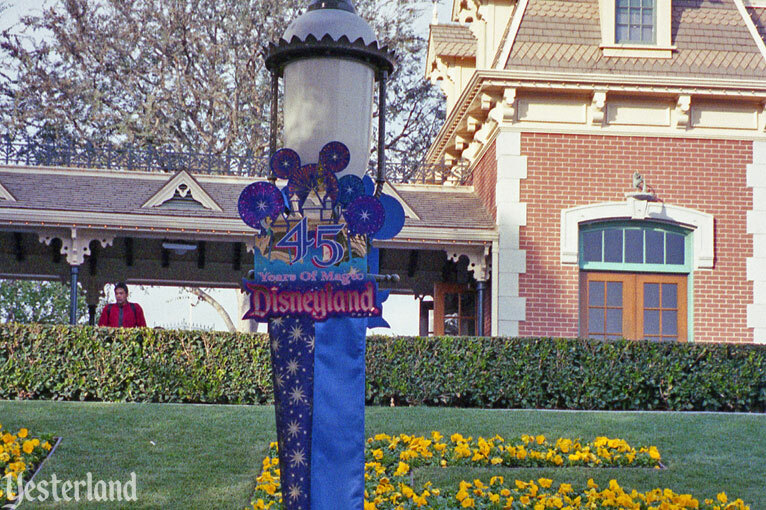 When Disneyland’s 45th anniversary celebration ended in 2001, the name of Disneyland 45 Years of Magic…Parade of the Stars was shortened to just Parade of the Stars. 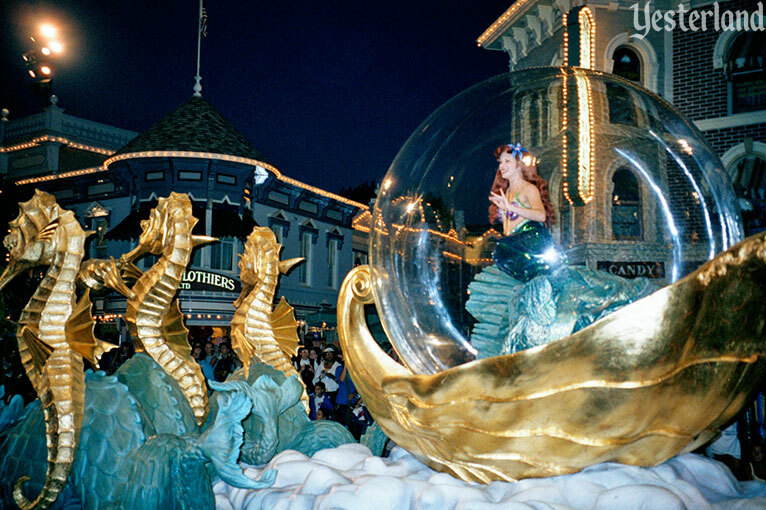 It continued to be Disneyland’s main parade until another major Disneyland anniversary. 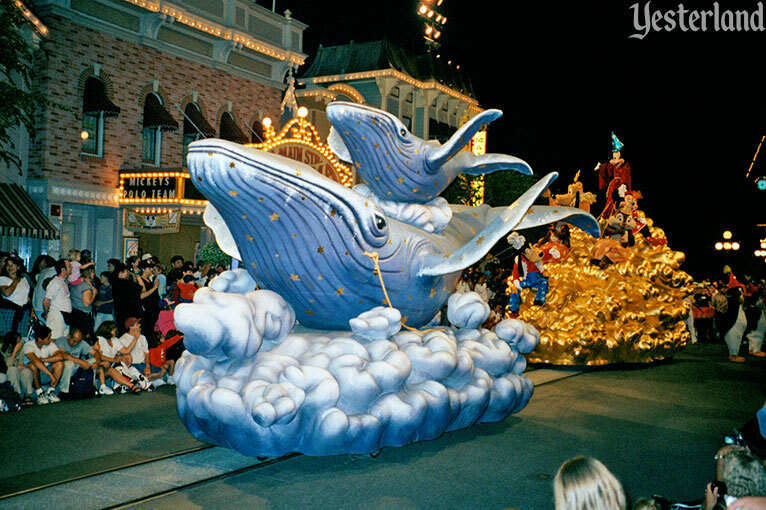 On May 5, 2005, the new Walt Disney’s Parade of Dreams premiered as part of Happiest Homecoming on Earth, the 18-month celebration of the 50th anniversary of Disneyland.